Background Percutaneous coronary intervention (PCI) in type C lesions has low success and has high procedural risk. We aimed at studying the outcomes of PCI in patients with type C lesions. 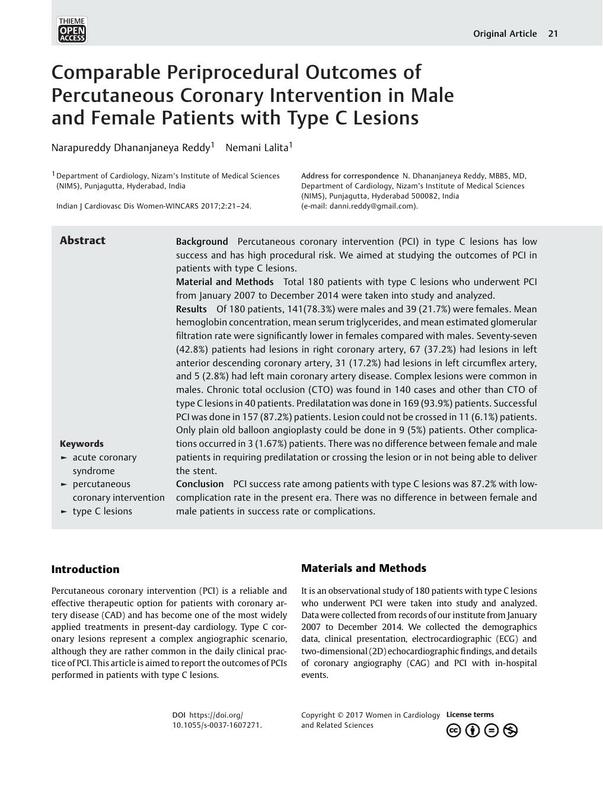 Material and Methods Total 180 patients with type C lesions who underwent PCI from January 2007 to December 2014 were taken into study and analyzed. Results Of 180 patients, 141(78.3%) were males and 39 (21.7%) were females. Mean hemoglobin concentration, mean serum triglycerides, and mean estimated glomerular filtration rate were significantly lower in females compared with males. Seventy-seven (42.8%) patients had lesions in right coronary artery, 67 (37.2%) had lesions in left anterior descending coronary artery, 31 (17.2%) had lesions in left circumflex artery, and 5 (2.8%) had left main coronary artery disease. Complex lesions were common in males. Chronic total occlusion (CTO) was found in 140 cases and other than CTO of type C lesions in 40 patients. Predilatation was done in 169 (93.9%) patients. Successful PCI was done in 157 (87.2%) patients. Lesion could not be crossed in 11 (6.1%) patients. Only plain old balloon angioplasty could be done in 9 (5%) patients. Other complications occurred in 3 (1.67%) patients. There was no difference between female and male patients in requiring predilatation or crossing the lesion or in not being able to deliver the stent. Conclusion PCI success rate among patients with type C lesions was 87.2% with low-complication rate in the present era. There was no difference in between female and male patients in success rate or complications.